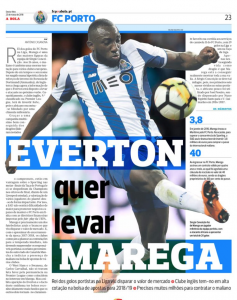 A Bola have a big article in their Friday edition which shouts out ‘Everton wants to take Marega’, and that’s the crux of it really. The Portuguese newspaper claim Everton are very keen on signing Moussa Marega from Porto, and will face competition from West Ham United and Swansea City. With Carlos Carvalhal now in charge at Swansea, the manager’s home country media are especially keen on what happens at the Swans, so will always have that extra encouragement to bring them into a transfer story. West Ham have made several attempts to sign players from Portugal, most notably William Carvalho, and it would be no surprise if another player in the country has caught their eye. However, A Bola think Everton can trounce all over their Premier League rivals in a race to sign the striker. Sam Allardyce’s club have ‘deeper pockets’ than the other, so would be more interesting to Porto. Marega has a buyout clause of €40m and any club moving for him would surely look for a discount. But Porto may well try and stand firm, given 26 year old Marega has 20 goals and 5 assists this season, having forced himself into the club’s starting eleven.